Engine mode on petrol and gas is significantly different. The engine running on natural gas has a high temperature in the combustion chamber, and at elevated temperatures, the conditions for the formation of carbon deposits on the details and the working surfaces of the power unit. In this regard, there are two issues: how often to change the gas engine oil, and is it makes sense to use a special oil for gas engine. Studies have found that the use of gas as a fuel prevents reduction of liquefaction oil film thickness due to the ingress of fuel, because gas is not condensed on the cylinder walls as gasoline or diesel fuel. All of this has a positive effect on the lubricating properties of the oil. Due to the higher temperature in the combustion chamber oil oxidation process is accelerated. 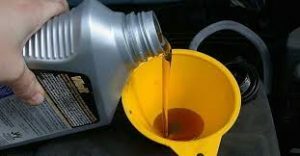 Despite the fact that the gas engine oil is not diluted and less dirty, change it should normally, according to the regulations and recommendations of the automakers, because additives in oil wear anyway.